How Do You Fit Everything In! DO YOU Ever Sleep? Well! A common question I get asked is how do I get so much done in my day! There are some that believe I never sleep! My secret is simple….. I multi-task! Probably at a higher level than most. So I thought I would share yesterday morning with you (between 8-9 am) so you know how I multi-task… and why no-one should be this crazy. Realised from Darren Draper’s twitter that his class which he had invited educators to assist him with was not on Wednesday morning our time but was on Thursday morning. So at 7.00 am our time I logged into the session! Coming up to 8 am, while still in Darren’s session, I realised that the etools n tips session that I thought started at 9 am was starting at 8 am. Pondered whether I could run two Elluminate sessions (virtual classrooms) on my computer at the same time and decided if both sessions could run then it meant my computer could cope so I must be able to cope! Had to, and wanted to stay with Darren’s session and wanted to attend Digital Story telling etools n tips session because I am presenting for these participants next week so needed to see the skills level of the participants. It was like sitting in two different lectures and you had to participate in both sessions with two separate voices coming into your ears. Text typing in both. Well okay except for typing in the chat not to run video in application sharing (in etools session) and opps response to Sue was “SUE we are in Web tour!!!! !” And then caught out by MR Draper who asked me to talk…spin out you can not make sense when someone else is talking loudly in your head! 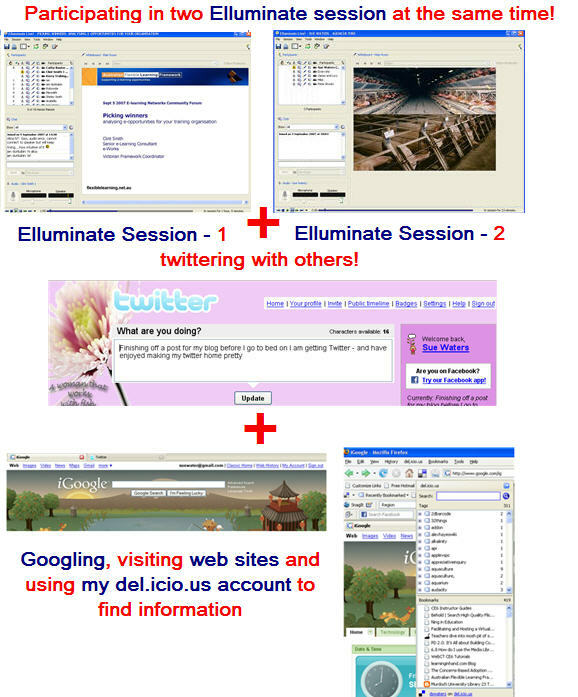 Googling answers, assisting with moderating one Elluminate session, twittering with friends, locating information on web sites and finding bookmarks in my del.icio.us account for both sessions. Wonder if computer can cope with 3 Elluminate session? Job for Saturday! Road test of online video creators! What The Crap Have You Been Writing About? And I thought I was mad??? Having participated in my class, Sue should now realize that I am what I like to call a unitasker. Pingback: GadgetGadget.info - Gadgets on the web » How Do You Fit Everything In! DO YOU Ever Sleep? That was hilarious. You’re raising the bar for us all. After spending a week living with Sue earlier this year I can account for the fact that her multi tasking is a regular occurrance. While staying at the Burswood she was up at 4.30am posting to he blog about my snoring keeping her awake , while also checking her stats, reading her rss feeds etc…..
Hi Sue, I thought I was doing okay until I read your how you do it…I have my freelancing mac for design in the middle of my kitchen, plus my laptop for my main work next to it…i can communicate, design and cook/clean/attend to kids and pets at near enough the same time…but…never will be as multi as you! Wow! No wonder you mention chocolate alot in your Tweets!!! Very good… yes you are the miracle multitasker! The one thing I can’t stand is when I’m working on comp at home and I have about 4 or 5 skype chats randomly starting all at the same time (professional and personal)… that does my head in. Pingback: Mobile Technology in TAFE » Blog Archive » Multitasking — Embrace The Future! Alex – well if it was not for you I would have been in an Abode Connect session, Elluminate session and a Yumga/SkypeChat session without anyone realising. LOL all because you wanted me to talk! Kristin – us women have to stick together. Kevin – apologies for making you laugh so much you cried and thanks for writing a post on it. Michele – I think the doctor was stressed that day? It is all about getting more out of your day. Frances – well you were snoring because you weren’t well. So I had to do something. Julie – I agree having a real problem now remembering how to spell words — brain overload? Laura – well I also cook dinner and iron. Have cooked and talked on Skype. Rachel – well you have me here. Not so good with lots of IM and Skype conversations at the same time. While I can relate to your desktop, I also credit my network for my apparent lack of sleep. The work they do for me, continues to impress others and I often get the credit. I try and share the truth as much as possible.